Can we dismiss UFO sightings as just a bunch of hysteria, or perhaps as misidentification? Is it a matter of weather balloons being mistaken for visitors from another planet? Before you answer consider this: millions have reported UFO sightings, including American former president, Jimmy Carter. And while some of those might be weather balloons, tricks of the sun, or other optical illusions, what are we to think of the many who claim that have had a "close encounter of the fourth kind" - who claim that they've actually seen aliens themselves? This fascinating documentary, produced by Creation Ministries International, doesn't offer the answers you might expect from a Christian creationist organization. Early on it seems as if they are making the case that at least some of these sightings and encounters are, in fact, real. They share reports from former air force officials, the findings of researchers, still unexplained film footage, and other evidence. But are these encounters with actual aliens...or is there something else at work here? Even as a case is made that some of these encounters must be real, we're also told why they can't be aliens. The distances in space are simply too vast, the speeds required too high, to the point that physics seems to rule out the possibility that we are encountering visitors from far distant galaxies. SPOILER ALERT: author Gary Bates and others argue that these are, in fact, spiritual beings - demons - masquerading as aliens. It's quite the intriguing premise! "...UFOs seem to appear within the understanding of the culture of the time. UFOs in the late 1800s appeared like airships. The ancient Romans and Greeks have stories of flying shields with occupants on board. American Indians have legends of flying canoes with people on board. And as we approached our rocket age...[they] started to take on the silver, shiny type of shapes." Similarly, "aliens" used to claim to be from Mars, Venus, and Saturn. However, now that we know those planets are not hosts to "massive civilizations of extra terrestrials" the aliens no longer claim to be from Mars or Venus. Instead they say they are from other systems or galaxies. There's also the correlation between UFO belief and occult experimentation – many "abductees" have dabbled in the “dark arts.” In asking for contact with demons, did they unknowingly invite these encounters? It is worth noting, too, that the messages “aliens” pass on are often direct attacks on the Bible, portraying Jesus not as the Son of God, but merely as some advanced alien. Even more interesting, several people who have been plagued by alien encounters, report that these encounters were very different after they became Christians. When they rebuked these "aliens" in the name of Jesus, they would leave! The only caution I can think of would be concern age-appropriateness. The nature of "talking head" documentaries is that children aren't usually interested. But just in case they are, parents should be aware there is a brief discussion lasting a few minutes concerning claims some abductees make regarding sexual violations by aliens. It is far from lurid, with Dove Foundation describing it as "clinical, clean talk." This is will be an intriguing documentary for any and all who are fascinated by UFOs, by science fiction, and by aliens. While the primary audience is meant to be Christians it would also be a great conversation-starter with unbelieving friends about how the Bible offers explanations for all of life...even including alien encounters! One important note: there is another DVD, also featuring Gary Bates, called Alien Intrusion that is simply a powerpoint video lecture. 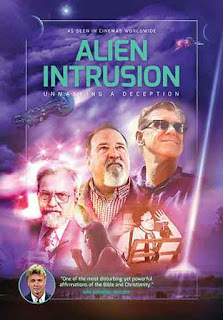 It has a different subtitle (one it shares with the Gary Bates' book that inspired them both) Alien Intrusion: UFOs and The Evolution Connection. The documentary is called Alien Intrusion: Unmasking a Deception. While the powerpoint lecture is interesting too, what you really want is the documentary, so be sure to check the subtitle and get the right one! 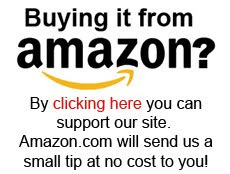 It is available at Creation.com under the "Store" tab at the top of the page.